In 2015, more than 307 million people visited the 410 sites that make up the National Park Service. And for good reason—in the century since its creation, the service has offered Americans and visitors a protected slice of the country's lushest landscapes and most staggering vistas. Countless pieces of prose have exalted the red layers of the Grand Canyon, the distinctive wildlife of Montana's Glacier National Park, and that end-of-the-world sensation of hiking on the edges of Alaska's Denali. Whether you're coming off a 10-day backpacking trip or a three-mile afternoon hike, having bucket-list adventures in America's wilds can really work up an appetite. Luckily there are plenty of places to eat both inside the parks and in nearby towns. And we're not just talking about wilderness canteens, either. These restaurants have padded booths, farm-to-table fare, and an honest-to-goodness "bacon sampler." Bon appétit, nature-lovers. Joshua Tree National Park has world-class rock climbing, dazzling rock formations, archaeological sites, and, thanks to U2, the perfect soundtrack, but its desert heat doesn’t exactly make you want to fire up a portable grill. The park is an easy drive from Palm Springs and the town serves as an oasis for anyone looking for a break from a campfire cooking. For alternatives to camp fare, head to Cheeky’s for its bacon sampler, which comes in flavors like ginger-sesame, Thai sweet chili, and apple-cinnamon. The menu changes weekly, but pancakes, waffles, and scrambles can give you plenty of energy for walking through Joshua Tree’s nearly 800,000 acres. For dinner, the Cheeky’s team also runs a steakhouse called Mr. Lyons, which offers the ideal antidote to hours in the hot sun: a porterhouse and the perfect Manhattan. The Olympic Peninsula may feel light-years away from the urban hustle of Seattle, but the peninsula is a key part of the Pacific Northwest’s culinary scene. The Olympic culinary loop offers maps of some of the farms, restaurants, and purveyors that ship their wares to the big city, including everything from Hama Hama oysters to locally caught salmon and even geoducks for those with the bravest palates. 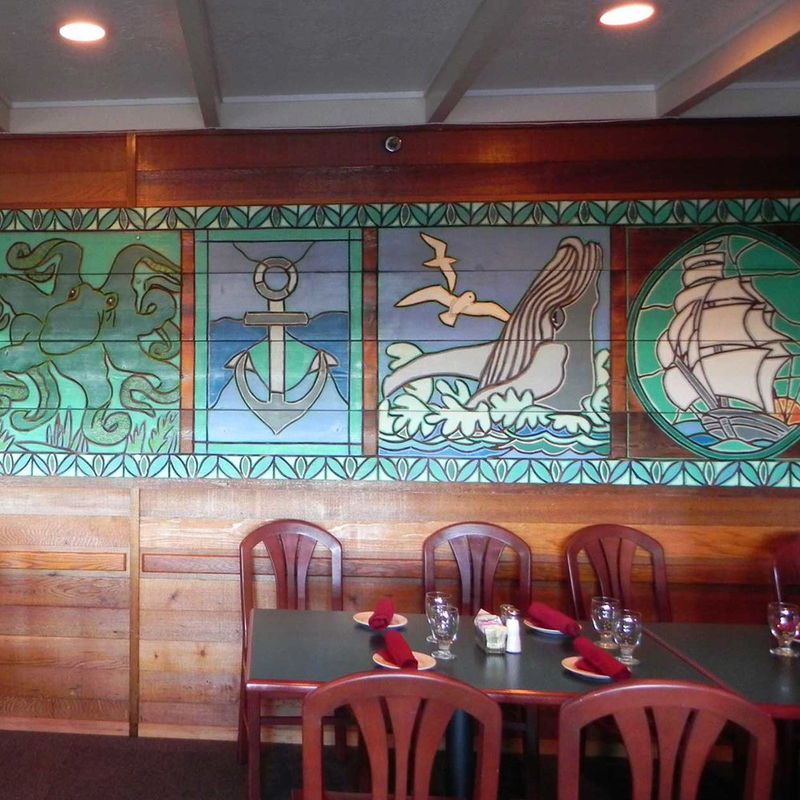 For true Washingtonian fare, try the Creekside Restaurant at Kaloloch Lodge inside Olympic National Park. Grab a seat overlooking the water and dine on sustainably sourced food from nearby farmers and fishermen. Think Dungeness crab cakes in jalapeno aioli, Oregon shrimp, grass-fed beef burgers, and plenty of vegan and vegetarian options. The restaurant, which also serves Lumberjack breakfasts and wholesome lunches, is open year-round. Yellowstone is dotted with lodges that offer decent food in a desirable setting. There’s the restaurant at the Old Faithful Inn that sits next to its eponymous geyser and the Lake Yellowstone Hotel, which sits on the National Historic Register. Both options offer wide-ranging menus with local options like Montana lamb sliders, red trout hash, and lunch and dinner buffets sure to satiate the whole family. When you tire of Park Service–approved fare, make your way toward Grand Teton National Park and into Jackson Hole, Wyoming. The Snake River Grill has a well-deserved reputation for serving up stellar cuisine. 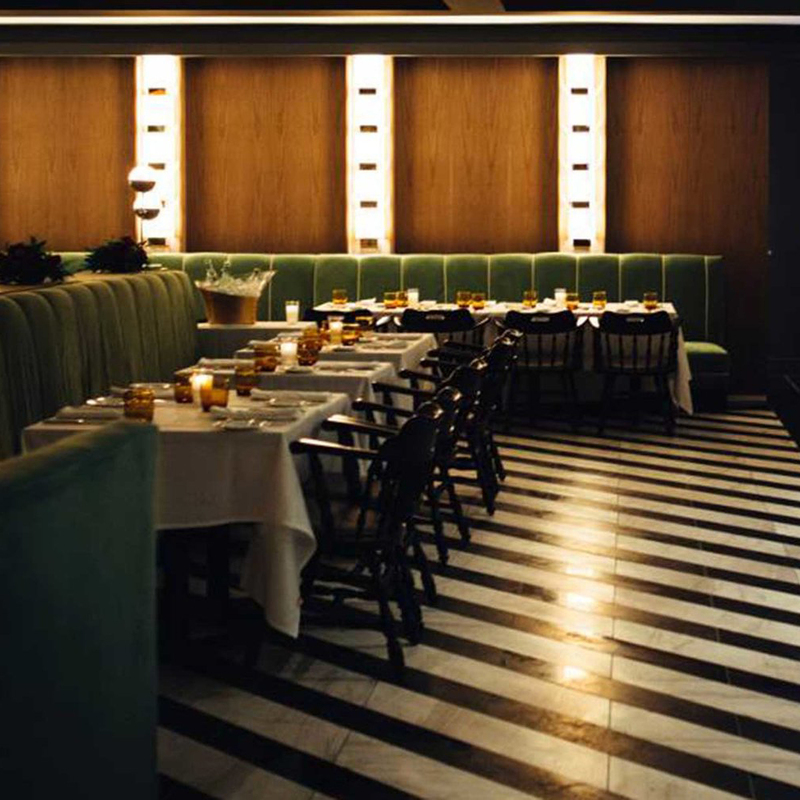 Think Kobe steaks, duck cassoulet, freshly delivered seafood, and an extensive wine list. For a more casual dining option, load up on home cooking with a Southern twist like fried chicken and waffles and steak frites at Café Genevieve. If watching Yellowstone’s wildlife romp through the fields has you considering a vegetarian lifestyle, head to Lotus Café for organic vegetarian and vegan fare. The Grand Canyon has been welcoming visitors since 1919, and it is perhaps the most famous of America’s national parks. 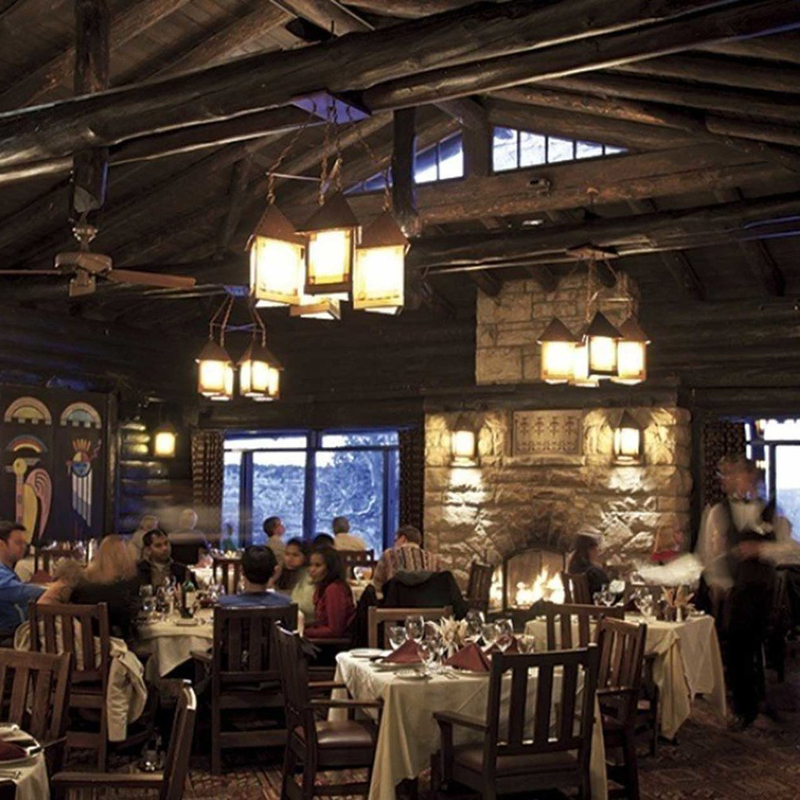 It can be filled with tourists during the summer season, so head to the park’s less-crowded North Rim to escape the crowds and find some of the best dining in the park at the Grand Canyon Lodge. Originally built in 1927, the National Historic Landmark serves up white-tablecloth fare with a Southwestern twist in a memorably beautiful setting. The menu offers regional specialties like bison flank steaks rubbed with honey and sage and a quinoa primavera with Anasazi beans and roasted corn. Plus, there’s a buffet that's sure to impress the kids. To dine with a different view, request a table at El Tovar’s Dining Room on the South Rim. Take in the incredible scenery while sipping on reds from their sustainable wine program paired with tamales, tostadas, or New York Strip Steaks. Whichever restaurant you choose, be sure to make reservations as far in advance as possible as they fill up quickly. The first national park established east of the Mississippi is tucked into a rugged stretch of Maine’s Down East coastline. When you work up an appetite hiking Acadia’s 125 miles of trails or kayaking and canoeing along the park’s many waterways, head to the Jordan Pond House to refuel. Grab a seat outside next to the namesake pond to keep one foot in nature while you dine civilly. 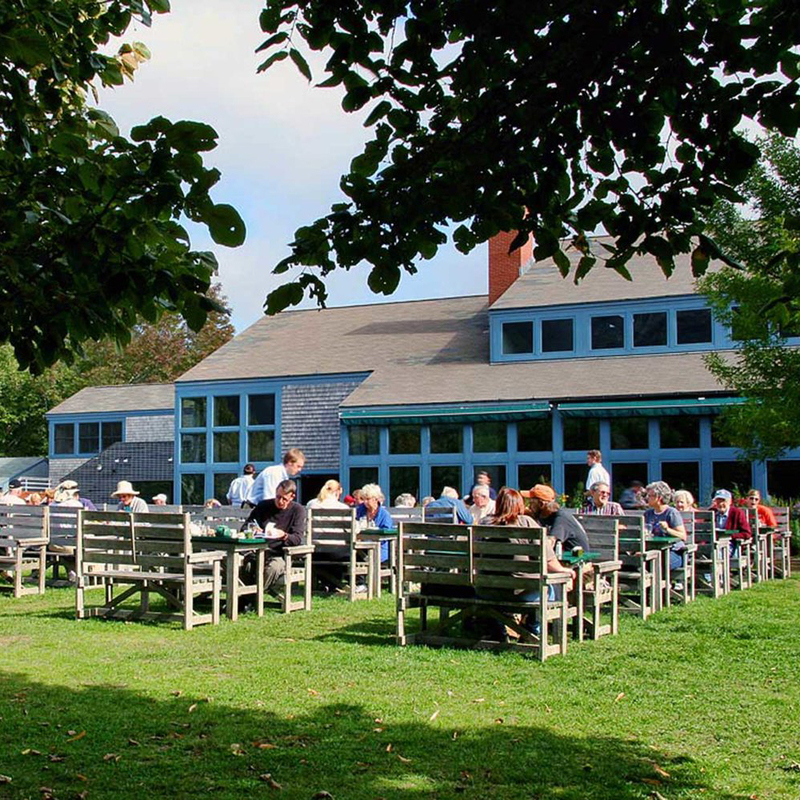 As you would expect for a Maine-inspired menu, Jordan Pond offers a lot of seafood options, including a Catch of the Day, chowders, and a jumbo lobster served with red potatoes, corn on the cob, and loads of butter. Whatever you order, be sure to add on some of their freshly made popovers. They also host an afternoon tea, offer grab-and-go lunches, and have a kids’ menu that’s sure to delight little hikers. Great Smoky Mountains National Park sits between North Carolina and Tennessee, meaning it is not only in a natural wonderland of waterfalls, wildflowers, and wildlife, but also in the heart of some incredible culinary options. First on any foodie’s list should be Blackberry Farm, 25 minutes from Knoxville and overlooking the Smoky Mountains. Whether you’re staying at the luxury hotel, or simply stopping in for their acclaimed farm-to-table fare, the visit will make your park tour even more memorable. Looking for something more low-key? 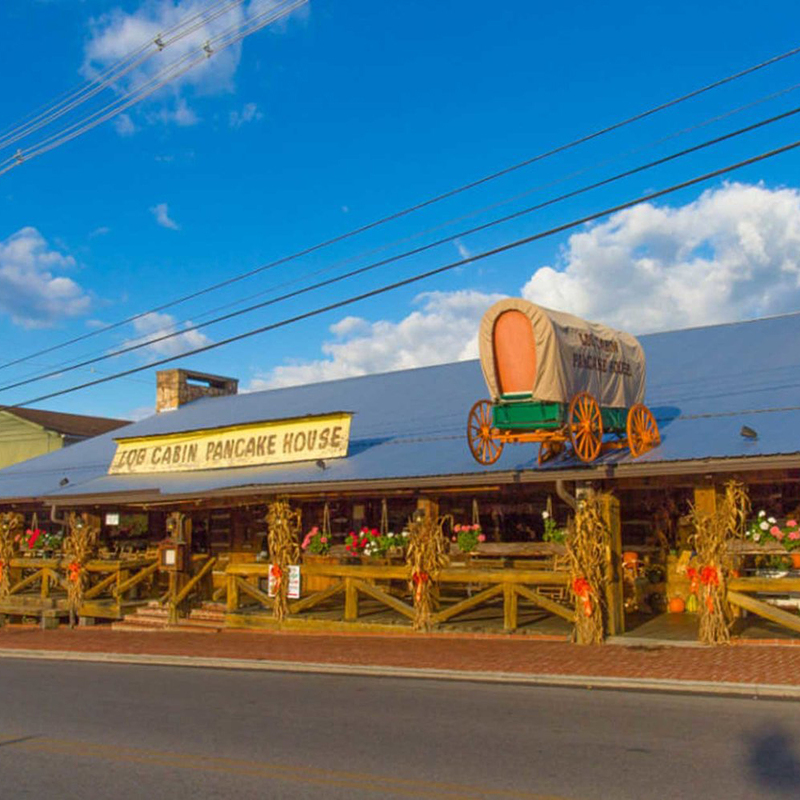 Grab hotcakes and home cooking at Gatlinburg, Tennessee’s mainstay: the Log Cabin Pancake House. Yosemite National Park lies east of San Francisco and all of its alluring cuisine, but just because you’re high up in the Sierra Nevada Mountains doesn’t mean you have to forgo fine dining. While 95% of the park is designated as wilderness, there are plenty of great places to eat. The restaurant at the Evergreen Lodge offers a creative take on the hearty fare you crave after a day spent hiking. Think burgers, venison, and cocktails that are worth the ascent of Half Dome. If you’ve still got more exploring to do, you can grab a sandwich from the general store before you hit the trail again. 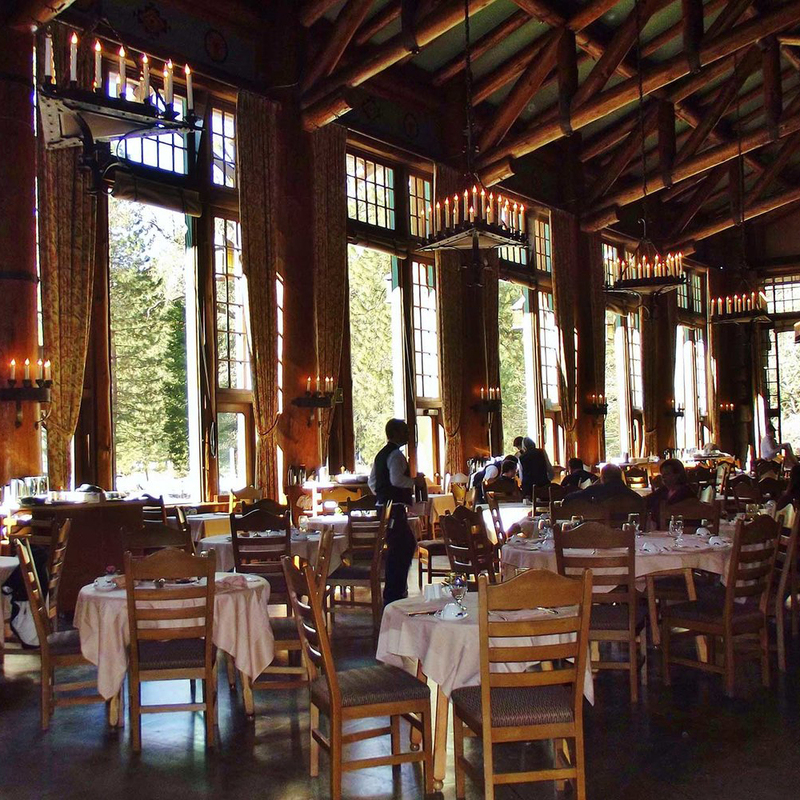 For celebratory occasions, head to the Majestic Yosemite Hotel, which past visitors may recognize as the Ahwahnee Dining Room. While the hotel and restaurant may have had to change its name due to a trademark dispute, the dining room—in both décor and menu—lives up to its new “majestic” title, especially for its famed brunch. 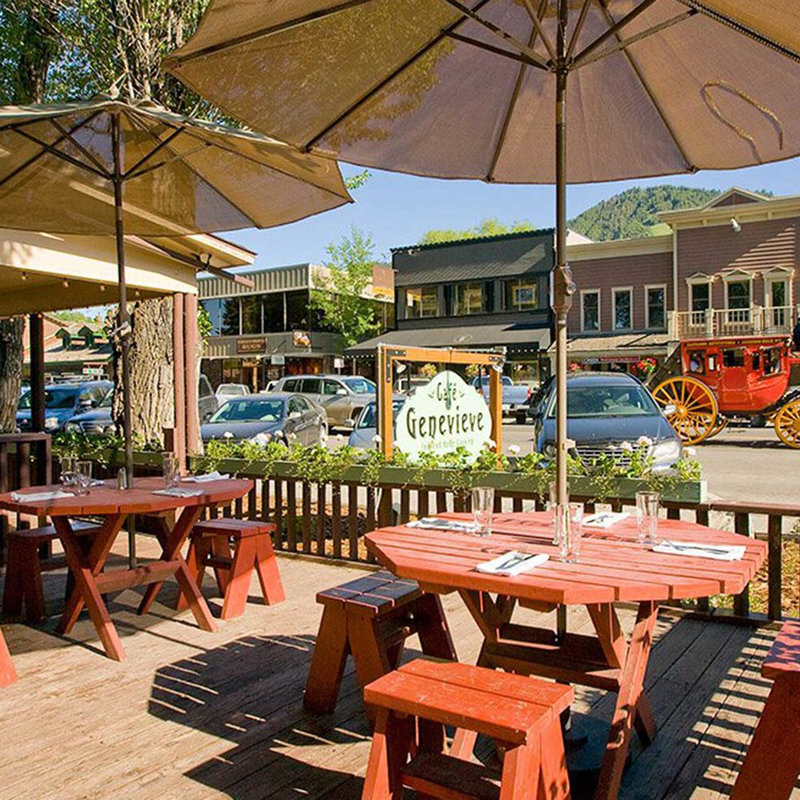 If you’re traveling toward Lake Tahoe, stop by Moody’s Bistro inside the 100-year-old Truckee Hotel to carbo-load for the many miles ahead at Jax on the Tracks, Lake Tahoe’s favorite diner.